Hello,I'm new to this forum and I thought I'd share what We did at our home.I had researched outdoor wood furnaces for about a year and I wanted to go with a forced air unit.I had some idea on making my own but never got around to it.This past summer a co-worker offered me an indoor add-on wood furnace that was in the basement of the house he had bought a couple years ago.This was my chance get things going.I thought I could modify it in order to put it outside so there wouldnt be any mess inside and my insurance company told me that as long as it was outside they didnt care if we had one.We hauled it home and tore into it only to find that the fire box was warped and rotted through in many places from the previous owner leaving the ash in it and rainwater entering from the chimney.This was obviously a major problem.My brother in law is pretty handy with a welder so I took it over to him and he had no doubts that he could beef it up and get it going for us.I also purchased a junk livestock trailer around the same time for $50 and I took it to ny brother in law so he could use as much metal as he needed to get the stove back in shape.Two weeks later I went over and we test fired it to check for leaks and found absolutely no leaks.I hauled it back home and started installing it.I placed it about 40 inches from the house,put it up on concrete blocks.bought some 8 inch duct work to pipe the hot air into the house and also 8 inch ducting to run a cold air return back to the furnace.The next step was a blower fan.I knew it need to be fairly small so it would'nt overcool so I went down to the scrap heap at the back of our farm and pulled out a clothes dryer that I had taken back there a couple years ago and took it to my barn to dismantle the blower motor/fan assembly.I used the sheet metal from the dryer to make a plenum in which to put the fan and attach it to the lower back of the furnace.tested the motor,wired it through a fan limit switch that came with the original add-on furnace.I also ordered some high heat insulation to place inside the outer casing of the furnace.With buying the chimney,raincap,duct work and the stock trailer i probably have less that $150 in the whole unit.I fired it up in late september of this year on a night when the temp dipped to 26 degrees.and man was i surprised.This little baby kept our whole 2400 square ft house warm as toast.we have been using it off and on for about six weeks and I have never been more pleased with one of my projects.I ran the heat duct in through my living room window and made a plywood frame with foamboard insulation so that no cold air can get in and no hot air escapes.I also wrapped the duct with the high heat insulation so I dont have to worry about the framework in the window getting hot.I placed an oven thermometer in the duct work and we average from around 100 degrees to around 200 degree air coming into the house and the return duct is hooked into our central heating return air duct so the air circulates through the whole house. I don't even know where to begin with this set up! You definitely need to send in some pics because (maybe its just me) but I have no idea how this is legal in any state. Your wood boiler is only 40" from the house?Did you pipe it directly to your existing chimney? I find it hard to believe you mentioned this to your homeowners insurance. Did you ask your town for a permit for this? Its hard to imagine an inspector saw this setup and ok'd it. Up to 200 degree air blowing in the house? Really? What is the type of heat exchange process that your using? You say you have 8" ducts coming in through the window of all places, and a cold air return going back to the boiler. Why do you need a return? I could be way off on this but I am very confused by this setup. Please reply to this Ribs1963 to further explain. I'm not trying to come off as rude here, I'm generally concerned with the safety of this. I can't believe no one else has commented on this. He does not have a boiler its a hot air furnace fan pulls heat off of the furnace and to the house and the return is supplying the air that it is blowing in his window. I dont have any pics yet but the firebox is approx 14 inches wide,27 inches deep,and I think it's around 22 inches tall with an ash compartment below.Then the outer insulated caseing leaves around four or so inches of space between the insulation and the firebox.The whole thing just looks like a common small forced air furnace.There are places online that you can get super high heat insulation that is used to refurbish old stoves.I think its spun ceramic and is rated at 2200 degrees.So far our Highest electric bill has been $175.The house temp hasnt fell below 72 degrees since we installed it and we've had it a lot warmer than that just to see what it would do.Theres a place in Missouri that sells manufactured ones similar in design to mine,I think it's called LIL' House wood heater.The one thing I forgot to mention was that I made a "heat dump" trap door on top of it just in case something should ever happen to the fan and I wanted to let all the hot air out before I could shut down the fire. Commercial units similar to this one include the Wadena home furnace, the Fire Chief made in Missouri, US Stove makes one and the previously mentioned Lil House heater. 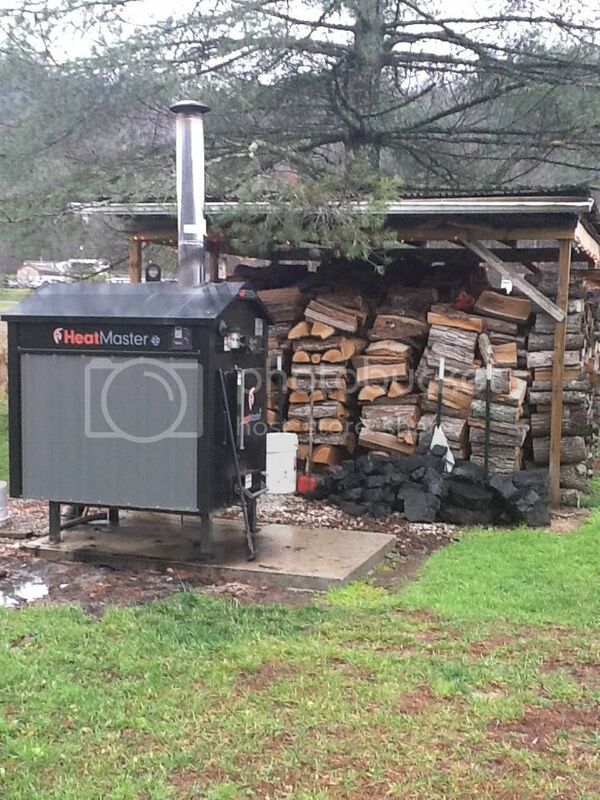 All have the advantage of being cheaper and simpler than an outside wood boiler. I know a few people that have these. They work but wood consiumption is higher because they have nothing to store heat in, "water"
Also, a couple of the people say that they are now having problems with the smell of creosote/smoke all through there homes.